Before using the Product Advertising API, you need to get register and become an author. To become a Product Advertising API developer, sign up or login. After Login/Sign Up following will come out. After creating your security credentials ,you need to download it, and maintain the record of ACCESS_KEY,SECRAT_KEY as it will be needed to make request to the amazon for searching products. Use the following Product Advertising API operations to return a list of items that satisfy your search criteria. ItemSearch Find items that are sold on www.amazon.com by merchants and most sellers. SimilarityLookup Find items that are similar to ones you’ve already found. Once you use the Product Advertising API operations in the previous section to get a list of items that match your search criteria, you can use the following Product Advertising API operations to return additional information about specific items. ItemLookup Returns descriptions of specified items. The parameters in the following table are required in every request. AWSAccessKeyId Your Amazon-assigned Access Key ID To register for an Access Key ID from the Amazon Web site, go tohttp://aws.amazon.com. Every Product Advertising API 4.0 request must contain either an Access Key ID or a Subscription ID but not both. 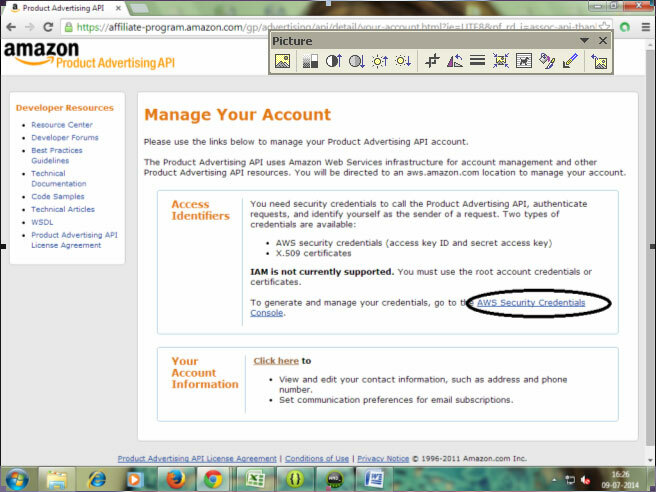 SubscriptionId Your Amazon-assigned subscription ID Every Product Advertising API 4.0 request must contain either an Access Key ID or a Subscription ID but not both. Starting with version 2005-10-05, Product Advertising API stopped distributing Subscription IDs. If you already have one, it will continue to work. AssociateTag An Amazon-assigned Associate ID The AssociateTag enables product URLs returned by Product Advertising API to be tagged as originating from your Associates website. For your requesst to work and to receive a referral credit for a sale, you must include an AssociateTag value in all your requests. Be sure to specify the value correctly; no error is generated for incorrect values. Operation Operation you wish to perform, for example,ItemLookup One of the Product Advertising API operation types. An optional parameter that can be used to filter search results and offer listings to include only items sold by Amazon. By default, the API will return items sold by various merchants including Amazon. The only valid optional value is “Amazon”. Specifies what subset of data to return. The API Reference Guide specifies the response groups that can be used with each operation.. Version of the Product Advertising API 4.0 WSDL. The default is 2011-08-01. If you want another version, including the latest, you must specify it in your request. Below is the GET request structure for the product search api. One has to query this url for the retrieving the desired result. Here is an sample example for building a amazon mobile app search .For building an sample app that search the mobile app feeded by Amazon Product Advertisement API. 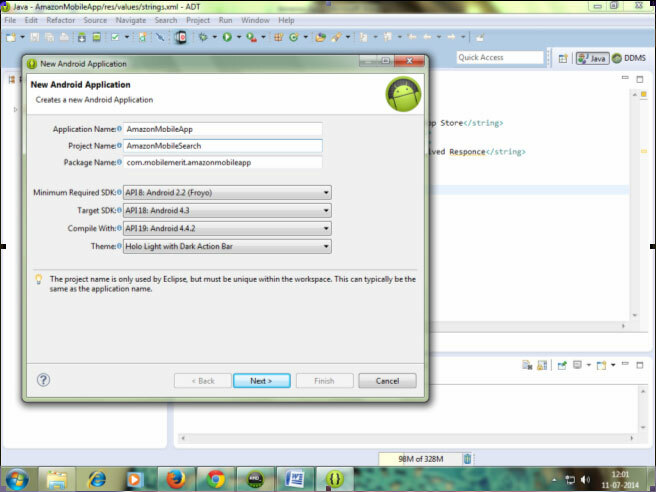 • Create a Android Application Project. • Create a SignedRequestsHelper.java file, this code is for signing the REST request and generating the Signature, which is needed for authentication. Where Map key corresponds to parameter key and Map Value corresponds to query parameter valid value. • Now we have the request URL builder set ready for the querying the Amazon api. As we are going to make a GET request to the REST API thus we have to build use AsycTask for doing this ,as for calling a network operation we have to use this in background thread. Here is the code for parsing the responce.. So implement this parser in your application to get the search result. We have considerable experience in developing apps using Amazon API. Over the years we have developed several advanced Amazon based Android and iPhone components, code modules and Frameworks that can work as plug and play solutions for developing new apps that will substantially reduce the app development cost and time.